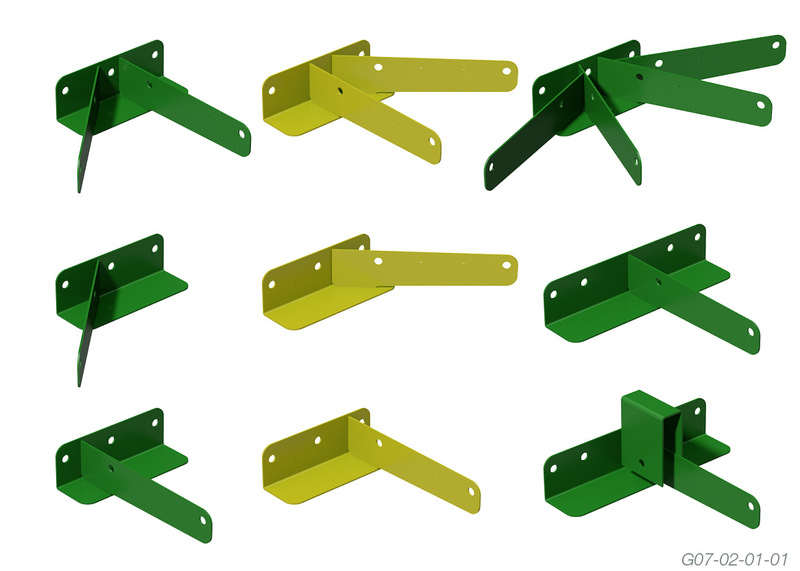 These steel girder brackets are available in various configurations. 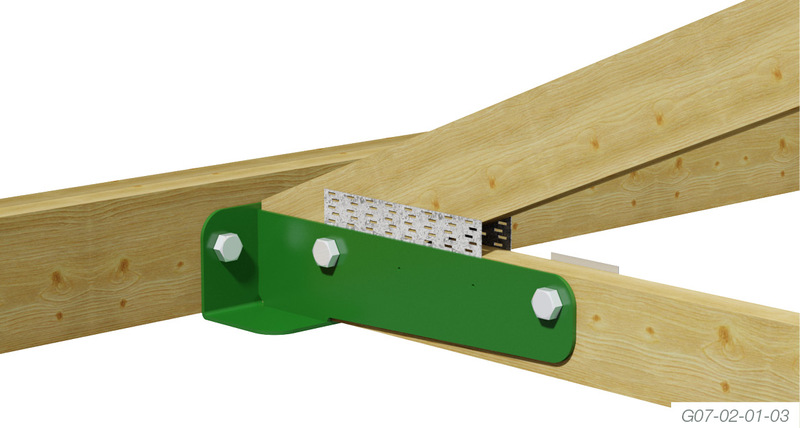 Heavy Load Truss Boot to assist in the tie down of trusses in high wind uplift areas. The extra clip dramatically improves the tie down value. 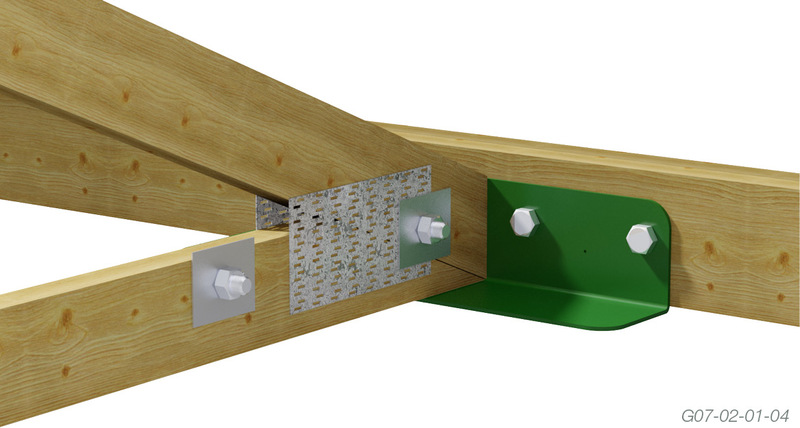 Place the High Load Truss Boot in the correct position and drill holes into the bottom chord of the girder truss to suit M16 Multinail Hex Head bolts. Align the bolt holes of the High Load Truss Boot to the bolt holes in the girder truss and install the M16 Multinail Hex Head bolts with the correct size washers. 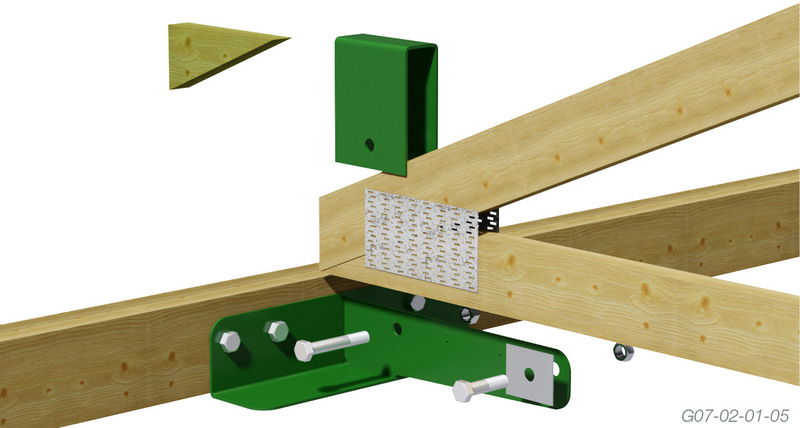 Place the supported truss on the bracket and drill holes into the supported truss to suit the required Multinail Hex Head bolts. Align the bolt holes of the High Load Truss Boot to the bolt holes in the supported truss and install the required Multinail Hex Head bolts with the correct size washers. Tighten all bolts before loading with roof materials. Bracket may sit below truss bottom chord. Alternatively, the supported truss bottom chord may be rebated by 4mm for a length of 96mm. Minimum girder bottom chord size for M16 bolts is 130mm. For a better fit, truss can be designed with a 4mm cutoff. Temporary bracing is required during installation. Minimum end distance for bolts is five (5) times the bolt diameter. Values DL + LL are for roof live loads. Based on K1 = 0.77. Bolts and washers to be installed as per AS1720.1-2010. Capacities as per AS1720.1 for bolt shear and testing. For all other joint group capacities contact Multinail Australia Pty Ltd.
For uplift, use minimum joint group of girder and carried truss. 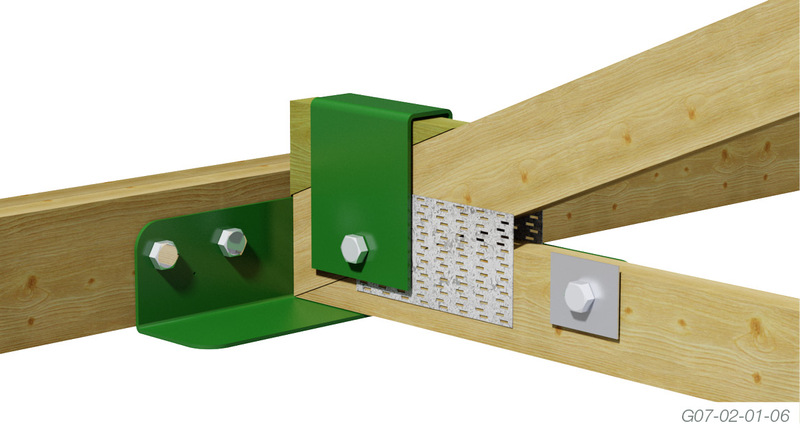 Place the High Load Truss Boot in the correct position and drill holes into the bottom chord of the girder truss to suit the 4/M16 Multinail Hex Head bolts. Place the supported truss on the bracket and drill holes into the supported truss to suit the 2/M16 Multinail Hex Head bolts. Align the bolt holes of the High Load Truss Boot to the bolt holes in the supported truss, clip and install the M16 Multinail Hex Head bolts with the correct size washers. Neatly insert timber wedge between clip and truss heel to ensure full bearing. The supported truss bottom chord may be rebated by 4mm for a length of 96mm. Minimum girder bottom chord size is 130mm. Timber wedge to be minimum same grade as top chord of carried truss. Capacities as per AS1720.1 for bolt shear.